Its old name is “Porunai” and it runs about 125 kms.. it is the river containing traces of copper ‘Thamiraparani’ also ‘Thamirabarani’ once considered a perennial river originates from the famous Agastyarkoodam peak in the hills of the Western Ghats above Papanasam in the Ambasamudram taluk and flows through Tirunelveli & Tuticorin districts of the Tamil Nadu state of southern India. There are many Srivaishnavaite divyadesams nearer this, the Nava Thirupathis. The city of Nellai – Tirunelveli, is a sacred place with so many temples in its vicinity and the famous “Nellaiappar Temple from which the city had its name. About 13 kms from Thirunelveli is the Krishnapuram temple dedicated to Lord Vishnu. Here he is called Thiruvenkatanathar. 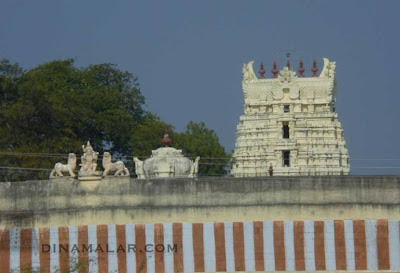 Krishnapuram temple also known as Venkatachalapathy temple is not a Divyadesam – it is more than 500 years old dating back to 16th Century. It was built by Krishnappa Nayak of 1564-1572. It is at Krishnapuram village on Thirunelveli- Tiruchendur main road. The temple is considered a wealth house of stone monument. The temple sculptures are noted for their high workmanship and artistic skills throughout the world. The figures of the sculptures are of life size and are carved with intricate delicacy. On the northern side of the temple, there is a Veerappa Naick Mandapam with two beautifully carved elephants at its entrance. There was a newsitem in obscure corners of newspapers but threatening indeed – ‘two powerful country bombs have been recovered from the 16th century Venkatachalapathy Temple at nearby Krishnapuram, police said on Friday 30th Mar 12’. The report stated that the bombs were recovered from the roof of the temple by a bomb disposal squad after workers engaged in cleaning operations discovered it and brought it to the notice of police. The bombs were later placed in a bucket of water and defused. Police said they are investigating all angles, including whether any fundamentalists were involved in the act. There is also another version that Police got an anonymous call, which led them to this discovery. Express News reports that the police found two bombs, packed in a polythene bag, on the roof of an office building located on the temple premises. The bombs were said to be covered by jute and threads, with chemicals like aluminium powder visible inside. Good that they have been found and defused – no damage done – but their very presence should provoke questions and fear amongst the devotees – Nothing appear to have shaken them and literally no body cares !! There are crores of devout Hindus who regularly visit so many Temples and contribute offerings to their Lord. It is these offerings which flows into the coffers making many others rich in the process. If a Temple attracts crowds, then there is so much of business opportunity for so many locals right from the flower vendors to big time industrialists. In Tamil Nadu, we have the Hindu Religious & Charitable Endowments Department [HR & CE] – which controls and administers the revenue earning temples. It is a Govt constituted body by the Act of 1925. There are many officials, workers, Administrative Officers and Commissioners depending solely on the revenue that is offered by the devotees at each Temple. With the plethora of officials backed up by more high ranking officials elsewhere administering them, the situation still remains pitiable. Most temples are not properly administered, repairs / renovations take place more with individual support than administrative backing, rituals often not followed, no amenities for the devotees who visit the temples, the maintenance, upkeep and embellishing the temple not properly done. There is the pitiable case of temple lands under the control of people who have nothing to do with the temple and not paying even the pittance – Temples own huge lands, donated from time to time by people – but revenue either not generated, too measly amounts, not regular in payments and not reaching the intended purpose. The revenue received in famous temples reaches the Govt, which in turn spends for all its other activities, mostly unconnected with the Temple welfare, the primary purpose for which they were offered. There is the Specially constituted Temple Protection Force, formed with a view to protecting the icons, jewels, hundi collections and other valuables in temples throughout Tamil Nadu. By their own admission, analysis of crimes perpetuated against temple properties over the past few years indicates an upward trend. The specially constituted force is not to be utilised for any other duties except temple protection. Despite all this, what is the reaction ? How were the bombs planted ? What were the sinister designs ? – how calamitous it would have been, if they had gone off ! – was it the handiwork of some extremists or is there any foreign hand as the Govt often puts it ? When will the Hindu Temples be safe and when will they be administered reflecting the tradition and enhancing the culture of this Holy land. With grief – S. Sampathkumar.